A RUP LIFE: New Amazon Prime Show - Dino Dana! New Amazon Prime Show - Dino Dana! 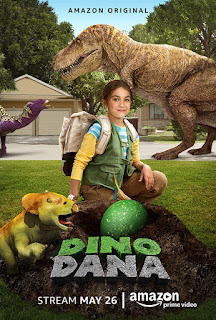 Dino Dana is a follow-up to the 2015 Emmy award-winning series Dino Dan: Trek's Adventures, Dino Dana is a preschool program that takes viewers on a whole new level of dinosaur encounters. Combining live-action with CGI animation, the series features 11 new prehistoric creatures and, for the first time, two sisters. After a chance encounter with Trek and his Dino Field Guide, Dana (Michela Luci), a "paleontologist in training," begins to see dinosaurs all around her, leading to plenty of action and adventure. Every episode shares interesting dinosaur facts and applies them to kid-relatable experiences. Created by J.J. Johnson (Dino Dan, Annedroids), the series is executive produced by Sinking Ship partners Johnson, Blair Powers and Christin Simms with animation executive produced by Matthew J.R. Bishop. ARupLife.com received product, press or compensation to facilitate this review. This post may contain affiliate links, which means that by clicking on an affiliate link I may receive a small amount of money. We only give our honest opinions of products. This post is in accordance with the FTC 10 CFR, Part 255 concerning the use, endorsements or testimonials in advertising.